CrestClean is a New Zealand owned and developed company that provides cleaning services to the property and business sector. Established in 1996, CrestClean has gained an excellent reputation as a capable cleaning service provider. Our team of over 1750 personnel clean for more than 4500 customers nationwide, making it the largest locally-owned cleaning company operating in New Zealand. CrestClean’s strength comes from a solid management structure supporting individual franchisees who are responsible for their own businesses and for carrying out their own particular cleaning contracts. CrestClean is 100% New Zealand owned and operated. In each city the Franchisees and Master Franchisee own their own businesses and support their local economies by growing and developing their businesses. CrestClean Franchisees are proud business owners. They take pride in their work and they build long-term relationships with their customers. Each Franchisee is well supported with centralised administration, training, marketing, and operational procedures. 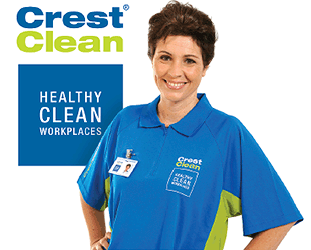 CrestClean is a leading brand in the cleaning industry and the franchise marketplace. The franchise system was twice a finalist in the prestigious ‘System of the Year’ at the NZ Franchise Awards in 2005 and 2006. We were awarded ‘Master Franchise of the Year’ in 2003. Our strong growth and corporate governance has also gained us national recognition with our inclusion several times on the Deloitte Fast 50, a ranking of the 50 fastest growing NZ companies. In 2012, CrestClean ranked 11th on the ‘New River Green 50’ list. This ranking recognised CrestClean’s strong environmental initiatives, as well as our growth as a successful participant in the green economy. CrestClean has a track record of innovation and industry leadership. We invest in people, systems, training and marketing to develop a thriving organisation that promotes “best practice” industry standards.